How do we score your sleep? Sleep is a complex process. As much as we do love to sleep, we know very little about what goes on inside our body while we are asleep. Contrary to the popular belief that our brain and body shut down during sleep, both go through several processes to make sure we’re ready for the next day — from burning calories to clearing neurotoxins to memory consolidation, and of course dreams. Our efficiency during the day is directly related to the quantity and quality of sleep during the previous night. Moreover it is crucial to maintain a good sleeping regime over a long run to continue leading a healthy life. 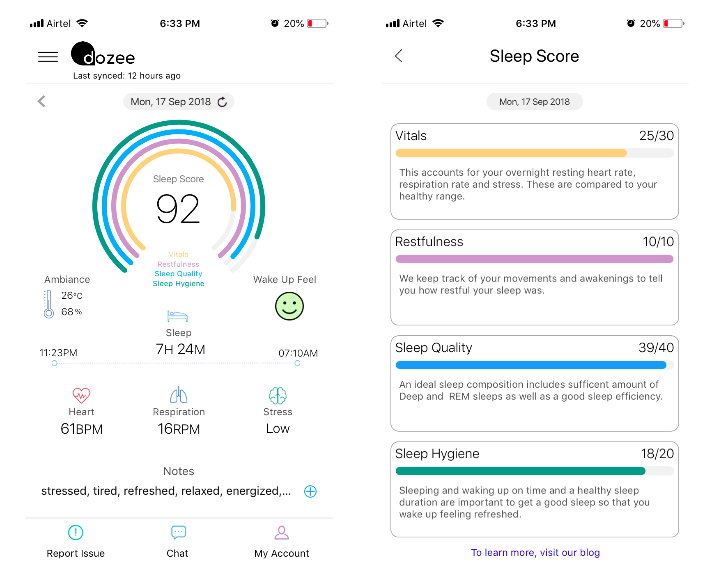 Dozee’s sleep score attempts to quantify the efficacy of your sleep by measuring several parameters related to your sleep including sleep hygiene, physiological state and restfulness among others. Sleep Hygiene (20 points) Sleep hygiene mainly revolves around the factors that are directly under our control — from sleeping and waking up around same time to a good sleep duration. Sleeping and waking up on time and a healthy sleep duration are important to get a fulfilling sleep so that you wake up feeling refreshed. All of us require different amount of sleep to function normally. It can vary with our age, lifestyle, physical and mental stress we put on ourselves. A minimum of 6 hours of sleep is necessary to flush out neurotoxins accumulated in our bodies during the day. It is believed that accumulation of these neurotoxins may cause serious health issues like Alzheimer’s disease. Our bodies have a natural clock which is governed by the hormone melatonin secreted by the pineal gland in our brains. During the night, melatonin levels go up and this makes us feel sleepy. In the morning the melatonin levels go down and we wake up feeling fresh. This melatonin cycle is governed by light, specifically the blue light (abundantly available in sunlight). Aligning our sleep time with the time when our body is most receptive to fall asleep (when the melatonin levels are going up) allows our body to quickly wind down and get the most out of it. We are all used to electronic displays of all sorts — smartphones to television screens. In fact, these displays emit a high amount of blue light directly in our faces, which affects the melatonin secretion, and makes it difficult for us to fall asleep even when we intend to, disturbing our circadian rhythm. Avoiding the use of such screens at least 30 minutes before your bedtime can significantly reduce the time it takes for you to fall asleep. Another important aspect of a good sleep hygiene is to sleep around the same time every day. Obviously it is not always possible to sleep at the exact same time everyday. We calculate bedtime resistance as the variation of your actual bedtime from the desired bedtime. 15–30 minutes on the either side of the desired bedtime is absolutely normal, however, a highly irregular bedtime can make it difficult for some people to fall asleep quickly which in turn can also affect our wake up time. Sleep Quality (40 points) A good sleep composition includes sufficient amount of Deep and REM sleeps as well as a high sleep efficiency. Deep sleep is responsible for physical restoration and recovery while REM sleep is related to memory consolidation. Both are equally important for a sound sleep. Our Intelligent algorithms allow us to identify these stages along with the light sleep. Ideally an adult human should get about 2 hours of deep and REM sleeps in an 8 hour sleep. Another parameter for sleep quality is the time taken to fall asleep (sleep latency). Taking 15–20 minutes to sleep from the intention of falling asleep is normal. Taking a long time to sleep while you are on bed with intention to sleep can be an indication of stress, unhealthy lifestyle or some disorder. We also calculate your sleep efficiency, defined as the percentage of time spent sleeping from the time on bed. This allows us to quantify the efficacy of your sleep. One of the factors that can lower our sleep efficiency is snoring. Not only that, it usually affects the quality of sleep of the partner as well. Our proprietary sensing technology allows us to identify each snoring instance while you are sleeping and account for that in your sleep quality. Restfulness (10 points) We keep track of your movements and awakenings to tell you how restful your sleep was. Sleep can be disrupted due to reasons ranging from physiological conditions like stress/pain to environmental conditions like uncomfortable room temperatures or even an uncomfortable mattress. Restless instances are periods of up to few minutes during which there are heavy body movements. During sleep our muscles are supposed to be relaxed and therefore we often do experience few movements. However, frequent and large number of body movements can affect the sleep quality and architecture. Few arousals and awakenings in the night are perfectly normal, but as the number of the awakenings go up the quality of sleep goes down. Frequent arousals and awakenings may even indicate sleep disorders like sleep apnea. Vitals (30 points) This accounts for your overnight resting heart rate, respiration rate and stress. These are compared to your personalised healthy baseline range that we build over a course of time of you using Dozee. It is normal for both heart and respiration rate to deviate from healthy baseline for few instances. This can be due to vivid dreams, nightmares or even room temperature variation. But consistent deviation from healthy baseline can be indicative of an illness, either in the developing or developed form. Stress, traditionally, is not considered as a vital sign but it is as important as the other vitals. We use stress to capture how robust your body’s physiology is to undertake mentally and physically onerous tasks. Remember, one of the most important goal of a good sleep is to relieve us of stress (both physical and mental) built up during the day. We rely on heart rate variability (HRV) to quantify stress — high stress lowers the heart rate variability and vice versa. Average overnight stress can tell us a lot about the state of our body. Overall these 100 points attempt to measure major aspects of your sleep quality. This score can be used to track how small lifestyle changes can help improve it with tangible positive changes in one’s lifestyle such as physical exercise or diet. Dozee is a contactless health monitor, that tracks user's biomarkers while the user sleeps. It's AI based Advanced Health Intelligence (TM) algorithms find early signs of health deterioration to help user stay on top of health.